Personalized for a dazzling presentation. 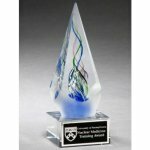 Arrow-shaped art glass award with helix and frosted glass accents. Laser engraved black plate. Hand made, air bubbles and color variations are common. Individually gift boxed. Hand made multi-colored art glass on a black glass base. 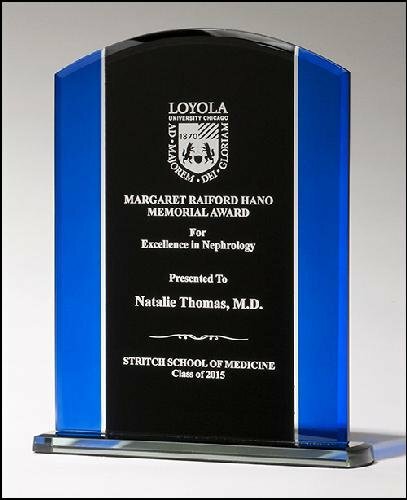 Laser engraved gold aluminum plate with black text and graphic. Individually gift boxed. 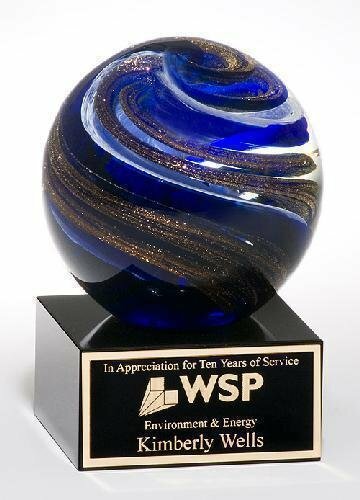 Art glass award orb with blue, white and metallic gold highlights. Laser engraved black aluminum plate. Comes in a padded, satin-lined box. 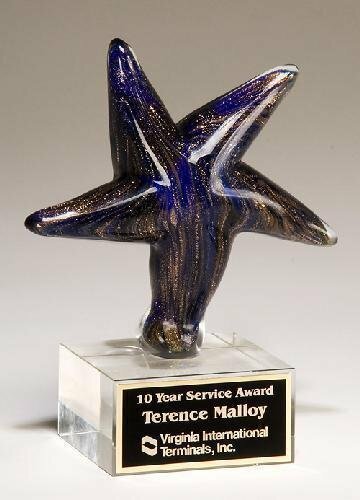 Blue art glass star with gold metallic highlights on clear glass base. Laser engraved black aluminum plate. Made by hand, air bubbles and color variations are common. Individually gift boxed. Glass 3/8" thick, silkscreened with black background, between silver aluminum posts. Your text laser engraves a frosted white. Individually gift boxed. Beveled 3/8" thick jade glass with black silk screen background sits in a silver metal base. Your text laser engraved a frosted white. Glass is removable. Individually gift boxed. Blue glass globe attached to clear crystal base. Laser engraved aluminum plate with silver text. Individually gift boxed. 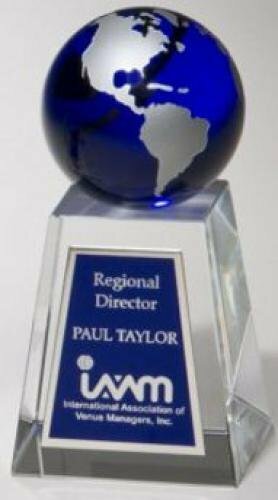 Blue mirror glass award. 3/8" thick glass with silvertone post at bottom for standing. Your text is laser engraved a frosted white. Individually boxed. Black and blue glass award with black glass base and felt bottom. Your text laser engraved a frosted white for easy readability. Individually gift boxed. 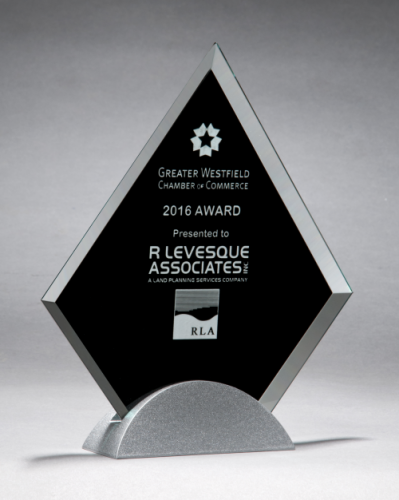 Black glass certificate plaque. 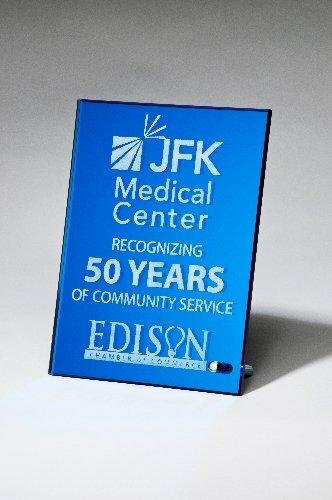 Holds your 8-1/2" x 11" certificate or photo (not included). Easy open and close back to add or change document. Two hangers allow for portrait or landscape hanging. Individually gift boxed.